Crumbs Bake Shop made its glorious return yesterday, reopening in Midtown Manhattan with plans to bring back 25 stores nationwide before the holiday season. With the comeback comes the return of softball-size cupcakes, but also some additional items behind the counter: the baissant and the crozel. 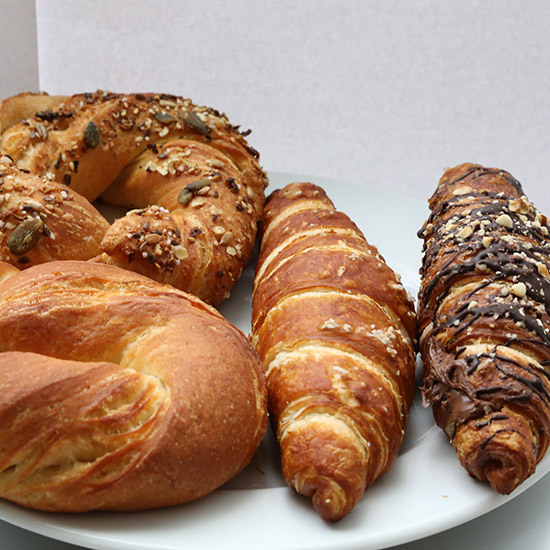 New owner Marcus Lemonis hopes diversification will restore some of Crumbs’ previous glory; and for those of you unfamiliar with hybrid food lingo, those are bagel-croissants and croissant-pretzels, respectively. Not exactly revolutionary thinking on the pastry front—Dominique Ansel came out with the Cronut more than a year ago and countless imitators have jumped on the bandwagon since, including Crumbs, which released the Crumbnut in April shortly before declaring bankruptcy. But we here at FWx think every baked good deserves a shot, so we stopped by Crumbs and picked up a round of baissants and crozels. The baissants come in three varieties—plain, everything and cinnamon-sugar. The crozels come in two flavors—plain and chocolate hazelnut, which is filled with hazelnut cream. Both new offerings are a bit tough—much more bagel or pretzel than croissant—although they pack enough buttery flavor to leave your fingers pleasantly greasy and your calorie count a bit on the high side for the day. The baissant, unfortunately, lacks some structural integrity. We dreamed of toasting it, but when cut, it broke into several pieces.